includes a map based on OSM data, like below. This entry was posted in Uncategorized on June 16, 2010 by Richard Weait. I politely mailed the WolframAlpha team about the missing license on the page and they answered: "We appreciate your feedback regarding Wolfram|Alpha. Your suggestion has been passed along to our developmentteam for review.Thank you for helping us improve Wolfram|Alpha. "Propably only a default sentence, but hopefully, they create a link to openstreetmap.org. 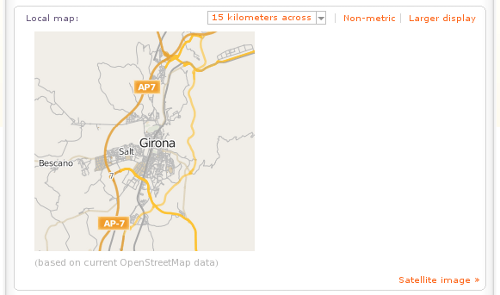 It’s a bit sad that Alpha is not using the same license OSM uses (or at least a license with the same spirit). OSM understands the meaning of the word "database", Alpha really doesn’t. Maybe they should take a look at http://www.ted.com/talks/lang/eng/tim_berners_lee_on_the_next_web.html.